Well, that was fun! Here is a quick post on my thoughts on the results of the 2012 Alberta election. 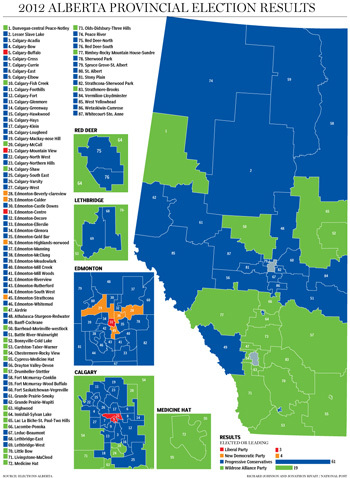 The 2012 Alberta general election is finally in the books and this will prove to be one of the most interesting elections in Alberta history. The series of missteps and amazingly incorrect polls will be analyzed over the next few weeks by all parties. It has been one of the nastiest, most passionate campaigns in Alberta history as anyone on twitter will likely confirm. I was really shocked by the lack of accurate polling over the entire course of the campaign. Right from the start of the campaign, the Wildrose Party was showing massive leads in every single poll. While there are probably a lot of explanations pending as to why the polls ended up so incorrect, it is clear that the Wildrose dropped a ton of support among "main street" Albertans following the "foot in mouth" moments by a few WRP candidates. The slow response by the Wildrose Party proved to spook a lot of Albertans, in my opinion. In talking to many casual political followers, it became clear that some people were uncomfortable with the statements made during the last weeks of race and it looks like it became a defining issue at the end. It is not a PCAA/Liberal conspiracy as many are saying. I do not believe that the WRP is a racist party at all. It simply proved to be a lack of damage control by the leader in the form of a quick, honest response. I think that the Wildrose may have made a mistake by failing to promote their candidates at the local level. It seemed like the strategy was "all leader...all the time". It seemed that every ad was targeted around Danielle Smith and really failed to highlight the local candidates. The fact that the public really did not know much about the local politicians that were running under the WRP banner likely added to the perception that they did not know who they were voting for or what they stood for. Here is a quick vlog post about my thoughts on the election results. The analysis in the days and weeks to come will be interesting. I hope to have a detailed post following up on the results once the dust settles.